Here’s something to celebrate the start of summer! Per person. Slice 1 medium courgette lengthways into 4 slices. Marinade in a little olive oil with finely chopped garlic and red chilli, then griddle on a ridged pan until tender. 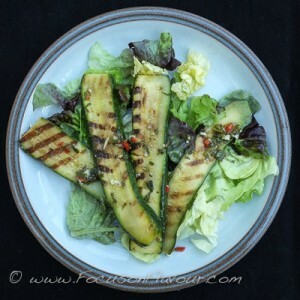 Toss with any remaining marinade mixed with lemon juice, chopped mint and chopped basil. Serve at room temperature on a bed of lettuce. Approx 70 Calories, using 1 tsp of olive oil. Would be nice with parmesan shavings or toasted pine nuts or other nuts/seeds sprinkled over. I just love this time of year, when there are fresh broad beans to pick from the garden! 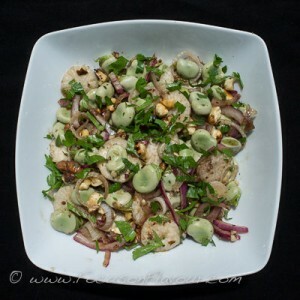 Here is a salad to celebrate delicious broad beans. This would work so well with a light fresh goat or sheep’s cheese, like feta! For my meat-eater I served it with some slivers of serrano ham and rosette sausage. I had it on a pile of green leaves with some Cantal cheese and sliced tomato. I haven’t calorie counted it as I didn’t weigh the ingredients, but it is the sort of healthy food that can be part of any day of eating. *vinegar aromatised with walnuts is a common ingredient here in South West France, where walnuts grow happily. If you can’t find it, then you could use some walnut oil to get that lovely nutty flavour. 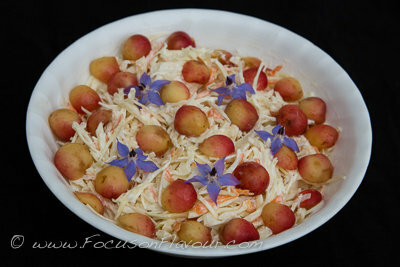 I used white radish as the red radishes looked a bit wilted in the shop, but they would be so pretty in this salad. Hazelnuts would work too, as an alternative to walnuts.